All Rights Reserved. No part of this website or any of its contents may be reproduced, copied, modified or adapted, without the prior written consent of Doras Bui, unless otherwise indicated for stand-alone materials. A number of the images we use are covered by the Creative Commons License, and have been make available on flickr.com by the copyright owner. These images are credited on each page they appear on, with a link to their page on Flicker. Do not copy any of these images from this site, instead please refer to the page on Flickr.com using the link provided. For any other mode of sharing, please contact the Director at 01 8484811. Commercial use and distribution of the contents of this website is not allowed without express and prior written consent of Doras Bui. The contents of this web site are for general information purposes only and are not intended to be relied on by any user for any purpose. Doras Bui accepts no responsibility for loss of any kind which may arise from accessing or reliance on information contained in this site. Doras Bui accepts no responsibility for the content of any external site that links to or from this site. 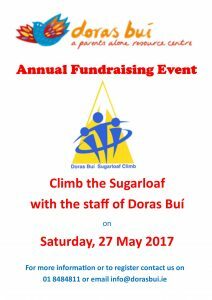 If you come across any content that you feel is inappropriate or in any reflects negatively on Doras Bui, please contact us at 01 8484811. Doras Bui provides links to Third Party Websites to enable you to visit other websites of interest easily. However, we are not responsible for the protection and privacy of any information which you provide whilst visiting such sites and such sites are not governed by this privacy statement. You should exercise caution and look at the privacy statement applicable to the website in question. When completing our contact page on our site, as appropriate, you may be asked to enter your name, email address, mailing address, phone number or other details to help you with your experience. We collect information from you when you complete a ‘contact form’ form on our site. We use the information we collect from you complete our Contact Page, or respond to a survey or marketing communication, to quickly process you’re query & provide relevant supports. The Fair Information Practices Principles form the backbone of privacy plays a significant role in the development of data protection laws around the globe. Understanding the Fair Information Practice Principles and how they should be implemented is critical to comply with the various privacy laws that protect personal information. A cookie is a string of information that a website stores on a visitor’s computer, and that the visitor’s browser provides to the website each time the visitor returns. They are not computer programs, and they can’t be executed as code. Also, they cannot be used to disseminate viruses. Cookies are stored on the computer’s hard drive. They cannot access the hard drive – so a cookie cannot read other information saved on your hard drive, or get your e-mail address etc. They only contain and transfer to the server as much information as you and your browser choose to disclose. A cookie in no way gives Doras Bui access to your computer or any information about you, other than the data that is openly shared by you and/or your browser. Doras Bui uses Google Analytics to help us develop and improve your user experience. Google Analytics uses anonymous cookies to log the IP addresses of visitors and generate reports. Google Analytics also collects non-personally-identifying information such as the browser type, language preference, referring site, and the date and time of each visitor request. This information is typically made freely available by web browsers and servers. No personal information is collected in the process. You can also consult your web browser’s help files, which can usually be accessed by hitting F1 on your keyboard while you are using the web browser.